I haven't done a frou frou type of gift wrapping since the holidays............a presentation way over the top in sugar & sweetness. 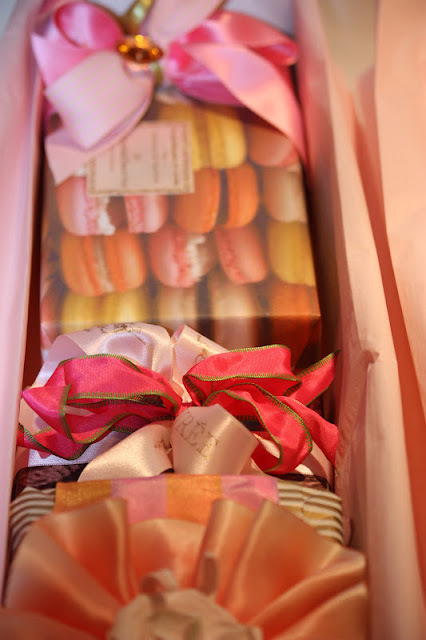 I spent part of my weekend printing out mararon style papers, hunting down my hidden stash of pastel Ladurée ribbon, and my aim was to go high on the sweetness scale for a friend's group birthday gift, one of those significant birthdays that require major spoiling. As it turned out, I think it's level of sweetness is perfect for Valentine's Day. Now to get these lovelies in a box that doesn't squeeze the sugar out of the paper macarons.......so to speak. I lined up the 6 wrapped gifts in 2 long white floral boxes, 3 gifts in each box. 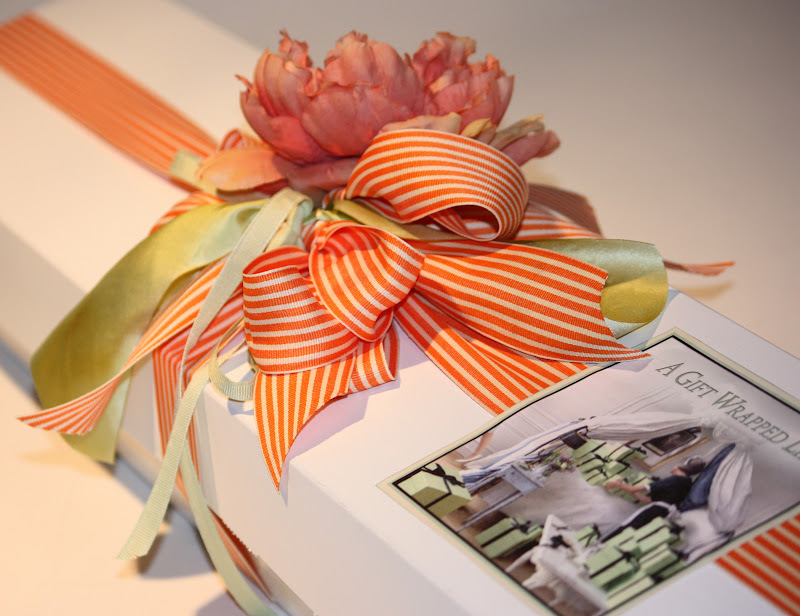 These simple boxes are the perfect way to arrange multiple gifts, no crushing of ribbons and quite the gift wrapped effect when the lid is removed and pleated tissue opened. When the event is special, I look to give the party girl a bit of oooh and ahhh, that's what makes the effort worthwhile. Of course, the recipient will anticipate long stemmed flowers but so far I have never had anyone mind that the box was filled with gifts instead and I use this long, slim box quite often. Though I order these in quantity online you could ask your friendly florist to sell you a few when needed for this type of presentation. Or don't forget to save them if you happen to receive some long-stemmed romance today. A monochromatic handwritten paper as my printer was running out of ink fast with printing out all these colourful macarons. I even tried a pleated ribbon medallion with a leftover piece of hand-dyed silk ribbon...........and as you know I am not a crafty gal but it worked. I have been asked if it is a bit crazy to put this much effort into wrapping gifts in this manner............it would only be crazy if it didn't make the recipient feel so indulged and all the ribbons can be ironed and re-used. If it enhances someones special day, I am all for being the crazy one. But that's not the bad kind of crazy, is it? Bring out the pastels, satin and silk ribbons, pearl ribbon, faux fur ribbon, paper flowers, soft tissue and crystal hearts. In other words, bring out the pink.....and girly attitude, no matter the age. The bright orange was my macaron paper favorite and I used it as a lid cover so the bottom box colour became part of the packaging. I think it added a nice saucy jolt to all the pastel tones. The bevy of gorgeous gifts for the beautiful birthday girl is a group effort, the gifts selected by the "best shopper" in our group, the "baker" bakes the sinfully rich chocolate iced cake, another makes the reservations, and I do the wrapping even though I am far from the best wrapper in the group. All of our good wishes are ready to be covered with layers of pink pleated tissue and closed up. Yes, believe it or not..........one more wrapping step. When you use a floral box, you can fuss up the outside as little or as much as you want............either way these slim boxes works really well for a presentation method. You can even get alway with just layering your gifts unwrapped in the tissue (clothing, books, diamonds). This is an older photo of the box as I didn't get a finish shot and no logo label on a birthday gift but you get the idea. Have the sweetest Valentine's Day! I am all for sugar & sweetness......any day of the year. ps that cake sounds divine! This grouping of gift wrapping if sumptuous and delicious. I love the idea of printing out papers of macaron rows, and that brings me to the next thought: Why hasn't anyone made a line of wrapping paper like this?? Macarons offer so many color possibilities. And only you can make orange look so beautiful. I know from experience that your long slim, flower boxes are the most exquisite container for all of the other wrapped jewels inside. I'm sure this birthday gal is going to be quite pleased! I've wrapped gifts in long floral boxes before and it is such an unexpected presentation that does bring on the ooh's and ahh's. Your combination of ribbons and wrap is so romantic. Wow - Happy Birthday indeed! 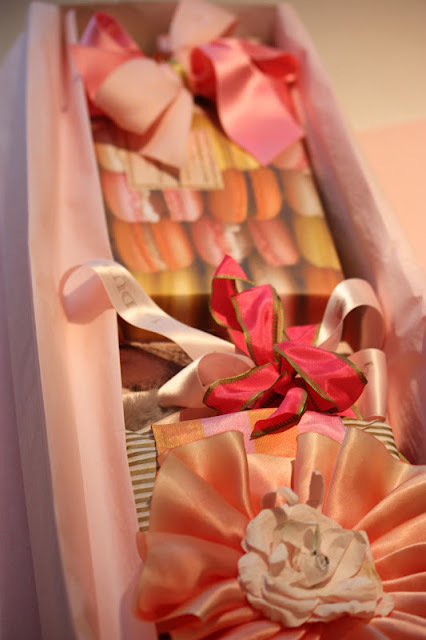 Beautiful wrapping- I wish my Valentine's gift had come looking like this! Absolutely gorgeous wrapping - what a treasure for the lucky recipient! You are so incredibly creative! What gorgeous colors and brilliant wrapping techniques. Hope your sweetheart showers you with perfectly presented gifts! Such a perfect idea for multiple packages. I can't imagine who wouldn't be extremely excited to receive such a beautiful package. Thank you for sharing, and I hope that you have a wonderful Valentine's Day. 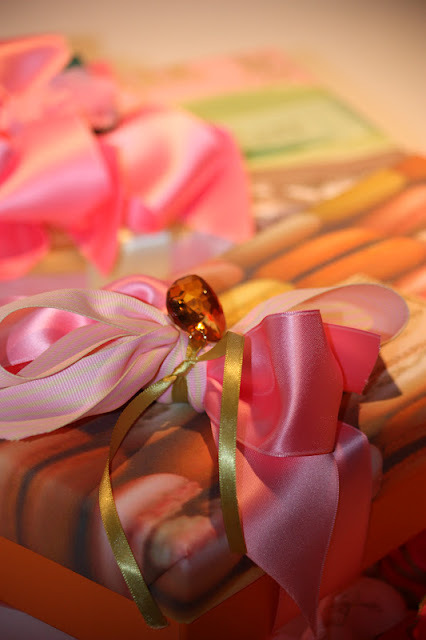 The colors are stunning - loving the gift with the pink and orange ribbon. They are so over the top gorgeous I think your friend might have a hard time opening them! This is absolutely gorgeous! Any woman would fall in love with a man who sent her a present like this! Such care and colour............a great way to say "I love you". What exquisite wrapping Sande ..... the ribbons are beautiful .....all are stunning, my favourite being the handwritten paper one. That ribbon is edible !! I love ribbon so much that I sometimes can't give it away on a present !!!! My husband doesn't understand !! Just gorgeous Sande and some great ideas for us all to help us with our gift wrapping. Wow! That would sure make my year! If you are not the best wrapper in your group, then something is seriously wrong with the world. Happy Valentine's Day! I absolutely love macaroons so this colourful paper really appeals to me - gorgeous! So much to love here! The last image...ahhh! I would not want to open such a lovely box and then again the outside would only serve to make me want to see what was inside. Happy Valentines to you an yours. Love the special wrapping. I too love to wrap gifts. 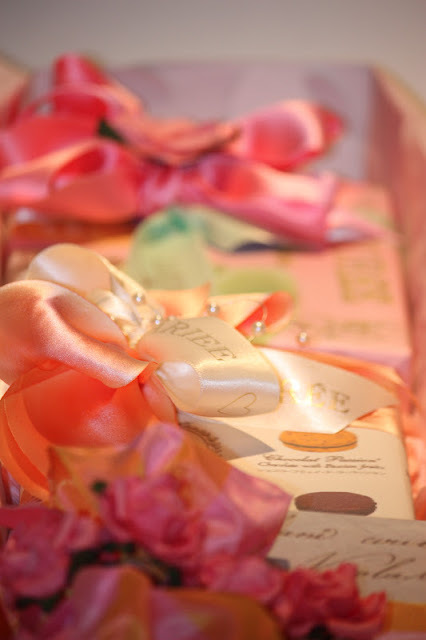 Love that you were able to reuse the Laduree ribbons I have saved all of mine too. Happy Pinkatine Day! Come visit me to see lots of pink almost all the time. box from New York I instantly thought of you! Shhhh don't tell him that! The most heavenly jar of Jo Malone Orange Blossom Body Cream. just how important it is to feel pretty. And to appreciate the box! and pretty wonderful things that you deserve. This is crazy beautiful! Hope you had a happy Valentine's Day. Best wishes. Oh my...these colors can make the heart beat faster. Really beautiful. The Macaron paper is devine. Happy Valentine's Day, Sande. Sande so gorgeous and such a surprise for any girlfriend! So lush, and layered and girly and wonderful! This is so refreshing for Valentines Day! Bright & Beautiful! Absolutely amazing - gorgeous and I would adore some of these beauties. how beautiful!! i love your wrapping!! Love your blog. So many ideas. Now I love your Pinterest Board. I remember a posting you made a while ago about a pom pom made with ????? It's was utterly gorgeous and I book marked it. Of course I can no longer find it. I was wondering if you still had the post or the link. I'd like to keep it and pin it to my board so I will have it available to me. Love you sense of style and color. Will you ship me over some of your creativity and lovliness? I adore this idea of using the long boxes and filling with surprises! This is gorgeous. What a fabulous idea for multiple gifts!! 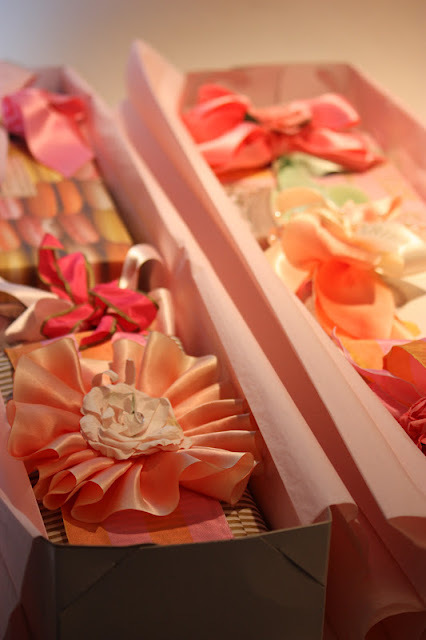 Can you tell us where you order the florists' boxes from? Beautifully Sande, everything you do, is done so elegantly.